I haven't blogged in a while because I had only one thing on my mind and I wasn't quite ready to share it with everyone yet. But after getting more wonderful news today, I have decided it is time to tell you all about it. I am sure you all could guess by now, and most would be right! So I will just get right to it - we are expecting a baby in August! We have been very nervous and scared, and I have been on bed rest for about 3 weeks now, but we have had two good ultrasounds with a good strong heartbeat! We are still a little scared, but for the most part we are just so thrilled. We found out four weeks ago. At about 5 weeks in I started bleeding. We were devastated and I was certain I was losing it. All of my earlier miscarriages have been between 5 and 6 weeks. But the doctor reassured us and said bed rest was needed. They did the first ultrasound at 6 weeks and 3 days and we were so relieved to see the heartbeat! They also found the likely source of my bleeding; a blood clot in my uterus. I have been taking injections once a day of a blood thinner called Lovenox since we got the positive pregnancy test and I also take a baby aspirin once a day. For those of you who don't know, I have a clotting disorder called PAI 4g/4g that only is a problem during pregnancy and can cause clots and even miscarriage. So I will stay on the blood thinner for the duration of the pregnancy. The Lovenox doesn't cross the placenta, and the baby aspirin does so it will help to ensure no clots on the baby's end. When we get closer to delivery time, they will change me to heparin which is administered twice a day so it is out of your system sooner to ensure a safe delivery. We went back to the doctor today for another ultrasound. We are 7 weeks and 4 days and we have a good strong heartbeat. Our chances of miscarriage now are only 5%, and I feel much better after seeing our baby has grown a lot in a week and has a beautiful beating heart. This is also further than I have ever gotten in a pregnancy since I had the boys, so that helps boost my confidence, too. And we are doing everything we can possibly do. I am also on progesterone because my levels were too low, which is probably the reason I lost my earlier pregnancies. While we are still being cautious, we are very optimistic this time. Once we get into the second trimester, I will stop worrying and just relax. That's not too far away! We had a good Christmas, it was just different. I was very sick and still on bed rest so that put a damper on things. We had our traditional breakfast here at our house, with my mom, Cathie and Matt cooking everything while I laid sick on the couch. Later, Matt took Billie to the cemetery to put wreaths on Michael and the boy's graves and then they went to Bill and Wanda's house for the afternoon. I slept most of the time they were gone. Poor Matt is exhausted trying to work all day and take care of everything at home - plus Christmas! He had to decorate the tree and wrap most everything. I am still technically on bed rest but they said today I could do a little more than I have been doing since it is having emotional effects on me being down for so long. If the bleeding gets any worse, it is back to straight bed rest, though. I am taking it very slow. I really don't have a lot of energy anyway, I guess from being in bed for so long. Plus I have ALL DAY SICKNESS. Which is good, they say, so I am trying to be thankful for it - but that is quite a challenge! We are so looking forward to a late July/early August baby and are praying everything gets easier and goes very smoothly. Billie is so excited. We told her after we saw the heartbeat for the first time. She was starting to get worried about me being "sick" and we decided after all she has been through it wasn't fair to let her worry like that. We wanted to protect her from another loss if we could, but after losing a parent she worries about losing me anyway and with me sick on the couch or in the bed nonstop day after day it was hard to watch her worry. She is such a sweet girl. She has been a big help to us, too. She is a little guarded, though, I can tell. She has her own defense mechanisms that have kicked in a little. But after we showed her the ultrasound today with the heartbeat, she seems very relieved and excited. She deserves a brother or sister more than any one ever could. I have seen God answer so many of my prayers in the last 3 weeks, it is just amazing. God is so good, all of the time. Sometimes, over the past 9 years, I have had to tell myself that over and over again, and still I had a hard time accepting it. But I feel it now more than ever. I feel this baby is the miracle we have been expecting from God. This is Billie at the Fantasy of Trees- her school decorated this tree and we found her ornament and her name on the skirt! She was so PROUD! It was a very cute tree. Happy Thanksgiving, everyone. We have had an amazing 3 days. Wednesday Matt and I both only had half days at work/school, so we came home and smoked ribs and a turkey breast. We had Matt's family over for ribs Wednesday night and we had a great time. Then on Thanksgiving we went to Aunt Shirley's for Thanksgiving dinner, and then that night we went to David's house for another Thanksgiving dinner. Friday morning, Kellee and I got at up 2 and went shopping. We were back home by 8:30, and very tired. I went back to bed around 10:30 and got up at 2. While I was taking my long nap, Billie and Matt went swimming with family at their hotel - big fun! Then we went back to David's house for left overs and then we all went to the Fantasy of Trees. It was beautiful this year, and we all had a great time. Billie especially loved shopping in the Secret Santa Shop and making crafts. We usually got to the gala before it opens and they don't have all the crafts and stuff, so this was special and new to her this year. While we did miss getting all dressed up and going to the gala, it was fun to do it this way for a change. Billie is going with Grandma and Grandpa Rosecrance to Dollywood today. So now it is back to work for me. I have two days of classes left, and two papers and a quiz due in those two days. My first final is Friday! I can't believe this semester is just days away from being over. Then I have to really concentrate on grad school applications. I actually already completed the online application for UT grad school, but I still have to do the Nutrition department application for UT. Then I am planning on applying to the nutrition grad program at GA State, and to 3 other schools that are just internships, not master's programs. I'm just praying I match and get in to just one. My actual first choice is a tie between UT and Life University, which is just a 9 month internship. It would be amazing to be completely finished in 9 months, but more of a hardship to relocate to GA. The good thing is that we still have a house there. But hopefully UT accepts me and we just stay put! They only accept 12 people, so I have to have a back up plan. I am also applying to one internship that is "by-distance" so you travel to them for a week and then they place you in rotations that are within an hour's drive from your home. But that one is my third choice, just because UT and Life both are more in line with my career goals, so they just make more sense. OK, I have rambled on enough - but it is good to get that stuff out of my mind! I hope you are all having a wonderful Thanksgiving weekend. This weekend we all went to Johnson City to surprise Brian for his birthday. His 60th is on December 1, so in order to surprise him, Cathie planned the party for this past Saturday. There was a great turn out, and we really had a great time. There was even a DJ and we all danced together! I will post pics once Janet and David send them to me, I let them be the photographers! I have one more presentation on Monday, tomorrow at 10am! I am nervous for this one because we have been making adjustments and corrections on it as late as today. We are supposed to memorize it, and I am trying, but I am pretty sure I will just have to lose a few points for looking at my notes. I just need more time to put it to memory. This is for my clinical class and the presentation is on a case study with Cardiovascular Disease. I have learned a lot working on it, though, and it is a neat assignment. I have clinical again next semester, and I bet we will do something similar again. Billie is doing good. She is trying to get over a cold. Actually, we have all had it. Matt and Billie are both doing better today, but I am still fighting mine. I am sure all of my late nights and early mornings studying have taken a toll on my immune system. But I get a four day weekend coming up, so hopefully I will have time to rest then! We are all really looking forward to Thanksgiving. I hope you all have a wonderful Thanksgiving, too! I will try to update over the weekend! Love to you all! Billie and Chandler helped my group with our creative piece to our presentation on sweeteners for a professional issues in dietetics class. I wrote the rap, and the girls performed it - on video. We did our presentation on Tuesday, and we ended it with this video. I will let you know when we get our grade, but everyone in the class was laughing so I think it went well! Tonight was Mommy Dance night at ballet. So guess what I did! Danced Ballet! It was so much fun! It is also so hard, they really make it look so easy and it just isn't. I, of course, wasn't dressed for it, but I didn't let that stop me. And they gave us tutu's to wear! Aren't we just precious? It really was so fun and I am so much more impressed with all that Billie can do, because it is just hard. We had the most wonderful time and I am so glad I was there today and got to do it with her. Sometime in February is their Daddy Dance week - won't Matt be cute in a tutu? Everything is going smoothly, for the most part. Billie and I are both very busy with school and Matt and I are both busy with work. But we are all doing great, just busy. Blue is growing, thankfully. She had an incident last weekend where we found out she had swallowed some of her toys - whole! It was very scary but she is now fine, we think. We just have to be very careful with her around toys. She is as cute as ever and sweet, too. Hope everyone is good. That is all the time I have now for an update... more when I can, promise! Love to all! Just a quick update. 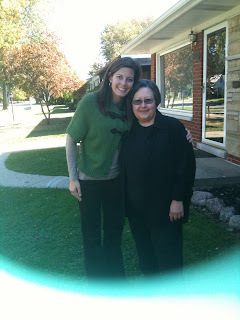 I actually poured my heart out in a blog earlier today on the prayer request page. I haven't updated the prayer requests in almost two years; the last one was January '09! I guess I forget that is there. I know when we built the website we thought we would have a year or more of raising conjoined twins and we would have daily requests, but since then I have struggled with prayer and I have finally realized that I have to give that up. When I am weakest, He is strongest. So I am giving that to God, I will struggle with it no more. To give you a quick update. I started my new job at Mercy Hospital last weekend. It was a very hard, long day, but I loved it. I am thankful for the opportunity; I am learning so much about my field, and I also learned I really don't want to work in a hospital. How great is that to learn so early?! It was not bad getting there at 6am, but it was hard to stay until 4:30! I was so exhausted, but you have to work until the job is done - there is no one else to finish it. All in all, it went great and I had been nervous for nothing. I am looking forward to my next day at work, but I am thankful I am off this weekend. I need some rest for sure! I had an exam this Monday in my clinical nutrition class; it was hard to work long days and then come home and study but it paid off and I performed well on the exam. Now looking ahead to the rest of the semester -but it is flying by so fast. I have several projects and papers to get done over the next 3 to 4 weeks - and then I will be done with the semester! Amazing! Even more amazing is January will be the start of my LAST semester of college! WHOOHOO! I see a light at the end of the tunnel and it is bright and beautiful and all worth it! Got to run Billie to the bus stop. Hope every one has a great day! Kellee, Uncle Arnold and Me - It was his wife, my Aunt Pauline that passed away. They have both always been so good to all of us girls. Me and My Dad, I haven't seen him in several years. 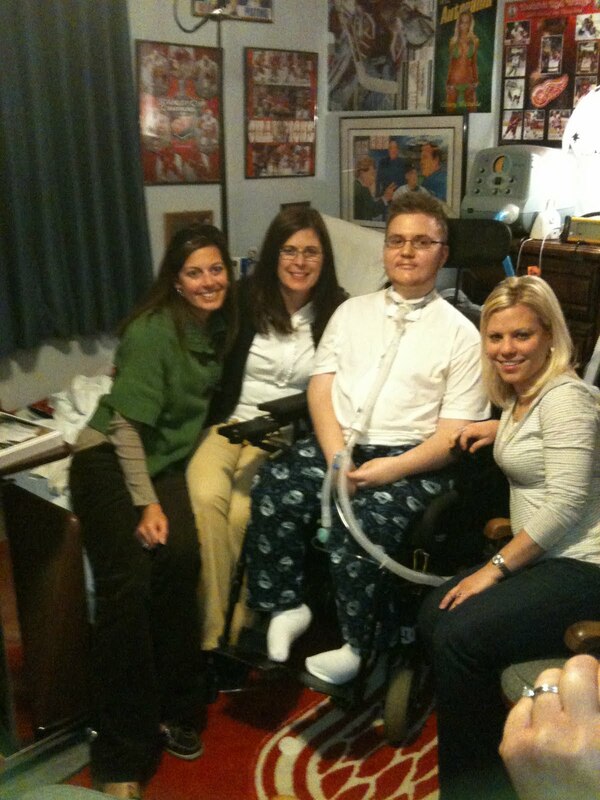 Me and Kellee and her cousins Brian (who has MD) and Cherry. My Grandma's House - Occupied by some strangers now! It was so weird, as we were taking this picture a man walked from across the street and walked right in! HEHE, I am sure he now owns the house, but it will always be my grandma and grandpa's house to me. OK, so evidently Billie got a rush scoring that goal because last Saturday she scored 3 goals! They won the game 4 to 2, it was their first win this season, too! We are all excited for tomorrow's game to see what happens this week. Unfortunately I missed the game last week because I went to Michigan. My sweet Aunt Pauline passed away and I went up for the funeral. It was sad, but it was also good to see my family. I stayed with my cousin Erin, and drove up with my cousin Kellee. We had a great trip. It was so nice to have my mom and all of her siblings together; that doesn't happen often since they are spread all along the eastern part of the USA. I especially enjoyed visiting with my Uncle Rob and Uncle John, they are always funny and up for a good time. 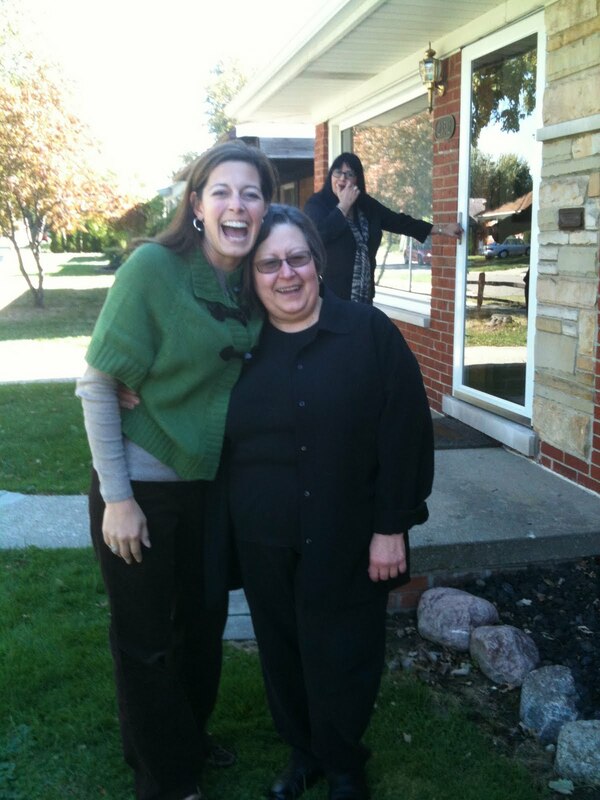 I didn't get to spend enough time with my Aunts, and that made me sad, but we didn't have a whole lot of time. I got to eat some great Chinese food (Michigan is home of the best Chinese food in America- Just FYI) and a Gyro at Coney Island. I also got famous fish and chips at an Irish pub with my dad and Aunt Brenda. It was great to spend time with everyone. The weather was amazing and they were a little further along in the change of colors up there than we are here. One thing I love about Michigan is there are sidewalks everywhere. We went on several good long walks while we were up there. We needed to since we ate so much! I envy Erin because she does get to walk everywhere she wants to. I posted some pictures up here for you all to see what I was up to last weekend. This weekend Matt is going to Michigan (too bad we couldn't have timed that better, huh?) for a football game. He is a loyal University of Michigan fan, and he and his dad are heading up there to see a game. It is an annual thing for them now. I am starting a new job at Mercy Hospital tomorrow. I am so nervous it is not even funny. I know the job won't be too hard for me, I just am nervous about not knowing anyone and getting lost. That place is so confusing. I will try to let you know how it went. I work 6am to 2:30 Saturday and Sunday; that makes me a little nervous, too. That is very early but good that I can get it over with and have the rest of the day with Billie and Cathie, who is coming to stay with us for the weekend and to take care of Billie while I am at work. I also have a big exam on Monday and a big project due Tuesday, so I will be very busy this weekend. Wish me luck; I am going to need it! Oh My Goodness! Billie scored her first soccer goal Saturday afternoon. It was awesome! She has always played fullback, so the opportunity to score has not been great in her three + years of playing soccer. But on this new team, she is by far the most experienced and the most skilled player so they are playing her at forward and midfield the entire game. So into the third quarter, (which she was supposed to sit out but another girl was hurt so she ended up playing the entire game), she was at midfield and got the ball. She dribbled it around the other team all the way to the goal and managed to kick it in with her left foot! It was awesome, she was so fast and just did everything right. I screamed and jumped up and down. Matt had a hard time not running onto the field and picking her up. He was ref'ing the game, so he somehow gained his composure and stayed on the side line. But he was screaming and jumping up and down, too. Even a good friend of ours, Jennifer, whose daughter was on the opposing team, was cheering for her. Her daughter, Natalie, had been on Billie's team for several seasons so she knows how far Billie has come in her soccer game. Billie was grinning from ear to ear, it was so precious. And she gave a couple fist pumps and leaps herself. We took her straight to Brewster's for ice cream after the game. She got a scoop of cake batter in a waffle cone and ate every last drop! She deserved it for sure. Since she will have plenty of opportunity the rest of the season, we are hoping this is just a taste of what is to come. She was thinking of giving up soccer after this season, but I am wondering if she will not change her mind after the feeling of scoring a goal. I just can't tell you how happy I was for her. Sorry I do not have a picture, I didn't even think to get my camera out. This is all I have time for now, but I will try to update again soon. Love to all! 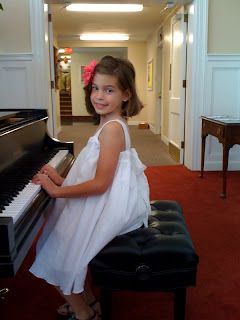 Billie had a piano recital this past Sunday. She played "Alice" from the new Alice in Wonderland movie, the song is by Avril Lavign. (not sure about how she spells her name-sorry if I butchered it). She had a replica dress from the movie. She was beautiful and did a beautiful job! I will upload the video when I have more time. School has both Billie and I very busy. I am teaching a nutrition class once a week for the NEAT program through the YMCA and health department. It is so awesome getting to work with the children, and getting some experience in my field. It is a really great opportunity for me. I also just got hired at the hospital in the diet office, but haven't officially started yet. My schedule is fixing to get even tighter, but it is all things I need to do if I am to get into grad school and get an internship, which is what I really want. I trust God will fit it all in for me, and still give me time to study and sleep and be with Matt and Billie, too! Sorry this is so short, but I have a million things to do before I get Billie up for school. Have a great Wednesday everyone! We have been so busy! Why is it when school starts back, so does everything else? Billie went back to school, and so did I. 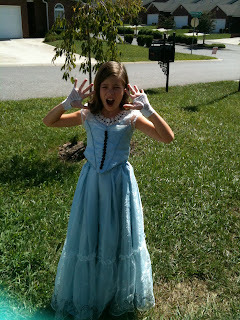 Plus her dance, piano, soccer and Wednesday night church all started back up, too! It has been crazy around here. Billie was also sick the first week of school. It was so sad. She went to school the first half day. The second day, which was the first full day, she went but the clinic called me at 8:30 saying she was in there with a fever and a headache and stomach ache. I immediately picked her up and when we got home her temp was 102.5! I was so worried; she never runs a fever. That was my first day of school. I had to attend classes otherwise I would be dropped from the class. Luckily our niece, Courtney, hadn't started school yet, she is attending another college here in Knoxville and they start a little later. So she came over and took care of Billie while I went to class. I was home in just a couple hours and took Billie to the pediatrician. She was so sick and hurting so bad she couldn't even walk in - I had to carry her! That hasn't happened since she was very little, mainly because she now weighs 70 lbs and I am just not able to carry her. So the final verdict was a sinus infection and a virus on top of that. She ran a fever until late Saturday afternoon, a full 4 days! So she missed the first three days of school, and had a ton of work to make up. She is all caught up now, and all better now, too. It was nothing serious, but she felt awful and it was so sad for her to miss the first week of school. I was feeling very overwhelmed, but now I am feeling better about everything. I am taking 19 hours this semester, which is a lot but very doable. I just have to stay organized and diligent. I love the classes I am taking. I am finally learning how to put everything I have learned to practical use. I have a clinical class where I get to put all of my knowledge to use. It is a little scary, though. What if I didn't learn it good enough?! I guess we will see soon. Blue is doing good, still trying to potty train but it is getting better. She is very good as long as I do not get too busy or distracted. But she does have accidents when I am not paying attention. She is still so sweet and so precious. We love her to pieces. I am so glad we have added her to our family. More later - time is a precious commodity lately! I was so saddened to hear that Emma and Taylor Bailey passed on August 10 due to complications during surgery. My heart is breaking for this family. I can only imagine what they must be going through. 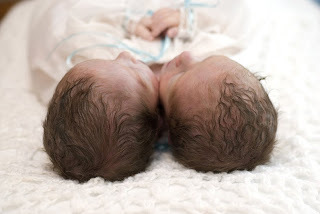 Joshua and Caleb were conjoined the same way as Emma and Taylor, but the girls had their own lungs and a bigger heart. They beat all of the odds their parents were given before their birth and lived to be 3 years old. But I know there is nothing that will comfort their parents today as they say good bye to their precious girls. I know God spared us so much pain by taking the boys shortly after birth, even though I sometimes envied the time The Baileys had with their girls, I know what they are going through today is much harder then what we endured. My prayers are with the family today, and will continue to be for many weeks and months to come. Please join me in praying for this precious family. 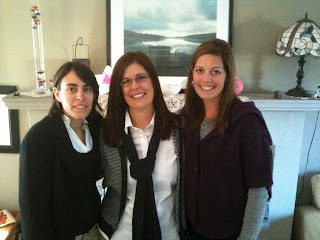 You can find a link to their blog here on our blog, too, so you can follow their story. Blue was very sick Wednesday morning. She woke up at 4:30 with diarrhea and vomiting and she felt hot to the touch and was lethargic. So I took her to the vet first thing that morning. When we got there the doctor said she thought it was parvovirus and she wanted to keep her there for observation and IV's. We were so scared! After just losing Bob on Saturday, the first thing poor Billie asked was "Are we going to have to put her to sleep?" It broke my heart. But the doctor was wrong and she ended up feeling better after a little IV and medicine. She got to come home at 5 that evening - and boy, was she happy to see Matt when he saved her from the vet! Poor thing, I am sure she had no idea why we had left her there, but it really was for the best. So she ended up having a water born bacteria that she caught from the lake. She is on an antibiotic and a special diet to help soothe her little belly for a few more days. She is feeling much better, though, back to her old self. She is also getting so big! She weighed 16.6 lbs when we took her in this week. Billie was so worried about her, as were Matt and I. I ended up with a migraine that night and I am sure it was stress-induced. You just hear parvovirus and you think the worst. The doctor said that there is an 85% success rate with treating parvovirus, but you all know how we constantly beat the odds in the wrong direction when it comes to health related issues, so that 15% seemed huge to us. It is amazing how bonded we have become with Blue and her with us in just 4 short weeks. But she is a huge part of our family now, and just being here during the day with out her here was so sad- and we even had and extra little girl, Chandler, here all week. We got to keep Chandler, our niece, during the day for the week. Billie and her had the best time together. They are so close, and I think the week together brought them even closer. School starts Tuesday for Billie. She didn't get the teacher she was hoping for, but I am sure the teacher she got will be great. She did get her very best friend in her class this year, so she was very happy about that. She said it would all be OK because she would have Kailyn to share her troubles with! So cute! Kailyn is a very good little girl and we love that they get to be together again this year. I think if she hadn't been in her class, Billie might have had a nervous breakdown last night after finding out which class she is in. Bless her heart; I have given her the "gift" of worry. I only have myself to blame; neither Matt nor Michael were worriers like me. So please keep her in your prayers- that she stops the worrying and that she loves her teacher. I know Billie and she will not want to go to school if she doesn't like her teacher, and that would break my heart and just not be fair to her. Hope everyone has a great weekend! Saturday we were forced to put Bob down, bless her heart. It was very peaceful, and we gave her lots of treats before hand. Friday night we took her out for ice cream and cheeseburgers, and gave her a whole bowl of popcorn, just for her. Saturday we took her to Johnson City and let Brian and Cathie tell her goodbye. We gave her more cheeseburgers and lots of doggy treats on the drive there. We took her to Karl Kapoor's office where they have been her Veterinarian her whole life. It was hard coming home and not having her here, but we know we had to do it. It was luxurious sleeping until 9 am Sunday morning and 7 am this morning, but it was bitter sweet. We really needed to get caught up on sleep as Bob hasn't been able to sleep in about two weeks, which means one of us was awake with her at all times. But I will miss her waking me up early so that I could have a productive morning, and I will hate waking up to an alarm - we haven't set one in at least two years! Waking up to a dog whimpering is much more pleasing than any alarm clock jolting you out of sleep, no matter what time it is! Matt is especially sad; she was his dog, after all. He lived with her almost as long as he lived with his parents! Billie took it harder than we imagined she would, but she is doing OK now. I am glad we have Blue to soften the blow for all of us. Bob may have been annoying in her old age, but we all loved her very much and she will be greatly missed. I am also thankful we had our family pictures made, just one week before we had to put her down, too. We had no idea at the time that she only had a week left, but we knew the time was getting closer. She just could not get comfortable and could not get any rest anymore. Matt had a very bad weekend. Not only did he lose his 16 year old dog, but he also stepped on a piece of glass (we think it was glass, but didn't actually see it) in the lake and had to get 5 stitches in the bottom of his foot. He can't wear regular shoes, and he can't put his weight down on it. It was a very deep cut. Hopefully it will mend quickly and he will be good as new in a week or two. No golf for a while, though! School starts next week for both Billie and myself. We are both ready to go back, I think. Billie is excited to see her friends and is hoping for one certain teacher (I won't mention who as to spare the feelings of all the fourth grade teachers.) I am excited that it is my final year in undergrad and I will graduate in May. I took the GRE last week, and it went great! I am still waiting for my final score, but I got my verbal and quantitative scores already and they added up to only 10 points less than my goal- so I decided that was good enough and I would just be happy with it! I am excited to see my analytical writing score because I really think that was my best part. I actually felt like I was cheating when I took it because the two choices I got were actually the two choices I had practiced at home from my preparation book! What are the odds? I told Matt it must have been God giving me a break for a change! I'll take it anywhere I can get it. But after I read the two options I was looking over my shoulder and up at the security cameras wondering if I was on a hidden camera show or something. I sped through the process and moved on to the verbal and quantitative and actually had time to spare on every section. It was really a relief. I was so nervous that I would go in there and bomb it. When I was studying for it I didn't feel like I was getting anywhere at all, but I guess I was. I was letting my decision to go to grad school be up to how I did on the GRE. I love school, love learning, and really want to get my masters and my RD, so I am glad the decision was easy and my scores were good. My hope is to get into the program at UT but it is very competitive so I may get rejected, and very disappointed. We don't apply until December, so I will let you know what happens. Wish me luck! We had family pictures made Saturday. We had a very good time, and got great pictures! We took everyone, even both dogs, to UT Gardens. It was a beautiful setting, and we beat the storm by about 10 minutes! We got so lucky. To update everyone on Billie's time at Camp Wesley Woods-- She had a blast! She was already planning to go next year on the car ride home. Her favorite parts were the rock climbing wall and the camp out. I only heard of the camp out after I had dropped her off and it made me worry. My friend said her daughter hated it; they don't sleep in a tent, they have a tarp they throw over a rope strung between two trees and lay one down on the ground for the "floor." I was so worried it would rain or storm and that she might be scared. Now when we camp, we use a tent so she has been "real camping," and only "real camping." But you all know me well enough to know I have to worry about something, so I worried about that. I guess God showed me; making it her FAVORITE part of the whole week. Not the horses, not the swimming, not being with 13 girls her own age, but the camp out that I fretted over the whole time. I don't know why I can't stop worrying, but I am going to continue to work on it. Billie loved camp; she loved all the bible study and learning about Jesus she got to do, that was also a favorite part for her. She was very glad they spent a lot of time learning about the Lord. She also loved all the camp songs and has been singing them to me since she got home. I am so glad she had such a good time. That is a wonderful experience for her, and I am so thankful she got to do it. I am taking the GRE tomorrow. I am so not ready, but I am scheduled so I will be taking it. Wish me luck. I have no idea how I will do, but I don't expect to do too well this first time. I will hopefully use it as a learning experience, and take it again in a few months to improve my score. Or maybe I will just get lucky and guess right! HEHE, I realize I am not a lucky person; so I plan on taking it twice. I will let you know how it went, but no laughing at me behind my back! Billie has been at camp this week, her first time at "sleep-over" camp. She comes home tomorrow, and I am ready! We got a letter from her yesterday; it said "Dear Matt and Mommy, I got your letter you sent me. I love you you are so cool. Love, Billie" And she drew a little picture for us, too. So sweet, and so frustrating. I so wanted to hear how camp was! Was she hot at night, did she fall in love with her horse, has she made a new "BFF," how is the food, how is your counselor?! I suppose I should have maybe told her something like that before she went, I just assumed she would write a letter explaining something about her experience at camp. I was so disappointed last night when I read the letter, I almost cried. But Matt was quick to remind me that if she didn't say "Help!" or "Come get me," she was probably having the time of her life. Tomorrow can't get here fast enough for me. I am so glad she was able to go, and I know she has had a great time, but it is hard not hearing from her. The letter yesterday did help a little, but, like I said, it wasn't enough information for me! I will try to blog Saturday and share her experience with you all. We tried to grow grass several times. It was always pretty nice in the middle of the yard, but around the fence and in the corners it was yucky, muddy, moldy and messy. So this was a super fix for us. 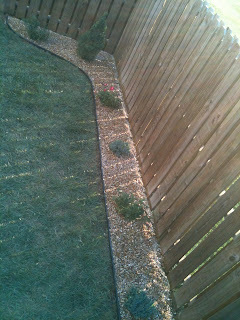 We planted juniper, knock-out roses, spirea, burning bushes, rhododendron and a couple different trees. 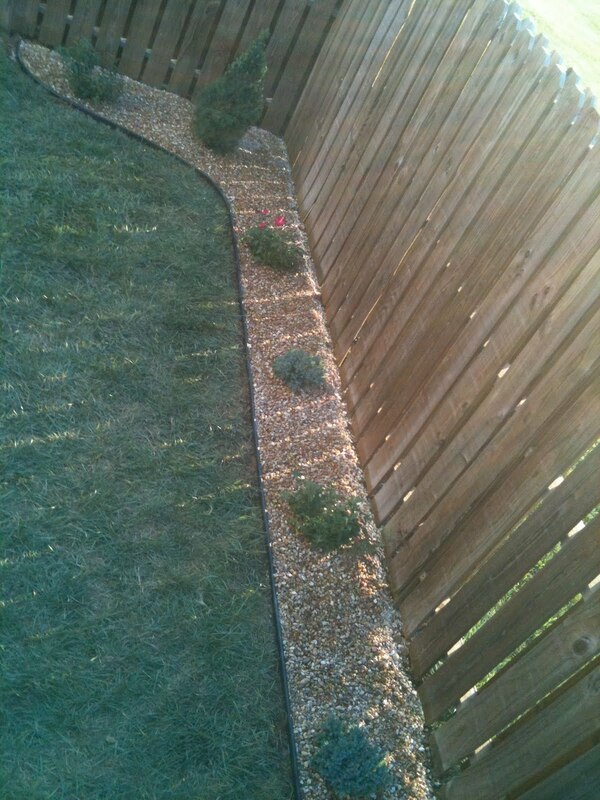 Then we dug a trench and put a border in to keep the rocks in, and we finally put pea gravel in over everything. We still need to do something under the deck where grass just won't grow. Our yard is tiny, so we really want to put something green in there. Any suggestions anyone has will be greatly appreciated. We have thought of placing some pea gravel there or even pavers, just to keep the dogs from getting muddy, but we hesitate to change the illusion of a bigger yard by covering up all the green under there. We have also batted around the idea of some kind of ground cover like a low evergreen, or ivy. Whatever it is has to be able to grow in deep shade. We love our "new" back yard. It is so nice to be back there. I can't wait for the weather to cool off a little now so we can also enjoy it in the day, not just evening and morning. Every plant was planted in honor of the boys birthday, and it makes me feel so good to have given life to something in their memory, even if it was only plants. It just feels good to be doing something positive. There is always that little nagging urge to stay in bed and pull the covers over my head and just wallow in my grief and I am so glad I am able to turn that into such a positive thing for my family to enjoy for years to come. We have to be out there several times a day with the new puppy, so it might as well be a pleasing place to be! Update on Billie's Ears: All is well! She is all better from the infection and the swimmer's ear is all cleared up, too. We took her to the Audiologist and while she does have tiny bit of hearing loss, it should repair itself on it's own and quickly. The doctor said she has "selective hearing loss" which we already knew, anyway! He cleared her to swim and enjoy the rest of her summer! Billie goes to camp soon. I can't believe I am letting her go for 5 days! But she has a friend from church going with her and I know she is going to have a blast. Let's just hope I survive the week! On a sad note, today is the anniversary of Michael's death. I will find time to sneak over to the cemetery, but I do not mark it in Billie's memory. I want her to have positive thoughts of her Daddy, so we celebrate his birthday and Father's Day and not his death. Who knows if I am doing the right thing, but I know I promised him I would always keep his memory alive, and marking his death just doesn't feel like I am doing that; it makes me sad and why would I want to make Billie sad? She already misses him without me saying a word. I will probably hug her more today and talk about her daddy more today, but I will not tell her why. Of course if she asked anything about his death, I would always be honest with her. When she thinks of her Daddy I want it to be happy memories, and I know that is what he wanted for her, too. 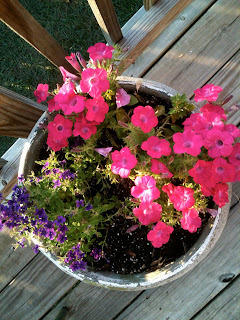 Ok, so the posting of the blog from my phone worked ok, but not the pictures so much. I thought you might want to see better pictures of them, so here you go! 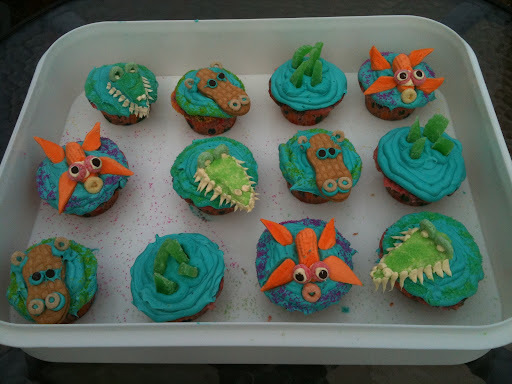 Just a quick post to share the cupcakes we made to celebrate the boys birthday with. I'm not sure how good the picture will show up, but there are crocs, hippos, koi and reed- supposed to be like things you find in the river in Africa. I know koi aren't in Africa, but it was the easiest kind of fish to make! And the reed is probably found more in the ocean but I thought it would look cute. We are headed to the lake to be with Brian and Cathie and celebrate with them. I am actually posting this from my phone. This is my first time using this app, so I have no idea how it will look or work. But I think it's so cool that I can now blog from anywhere! It's slower, though, typing on the phone so they will have to be shorter posts. I'm sure I will have plenty of typos, so don't hold it against me. Last night we had my mom and Danny over for dinner. We had a great time. We were excited to share with them Blue and our newly revamped back yard. It was a fun evening. Now on to the lake for more fun and the finally to our birthday festivities. We plan on continuing the tradition Amy started last year and writing messages to the boys on balloons and sending them up to sky. I am so thankful to God for helping us heal and giving us the strength and ability to remember and honor Joshua and Caleb without sadness and longing. God is good all of the time. Happy Birthday Joshua and Caleb! I can't believe it has been two years, (or it will be around 4:30 today) that I held my beautiful miracle twin boys! I know I have said this before, but on one hand it seems like yesterday and on the other it seems like a lifetime ago. The good thing is we have healed so much since July 15, 2008. 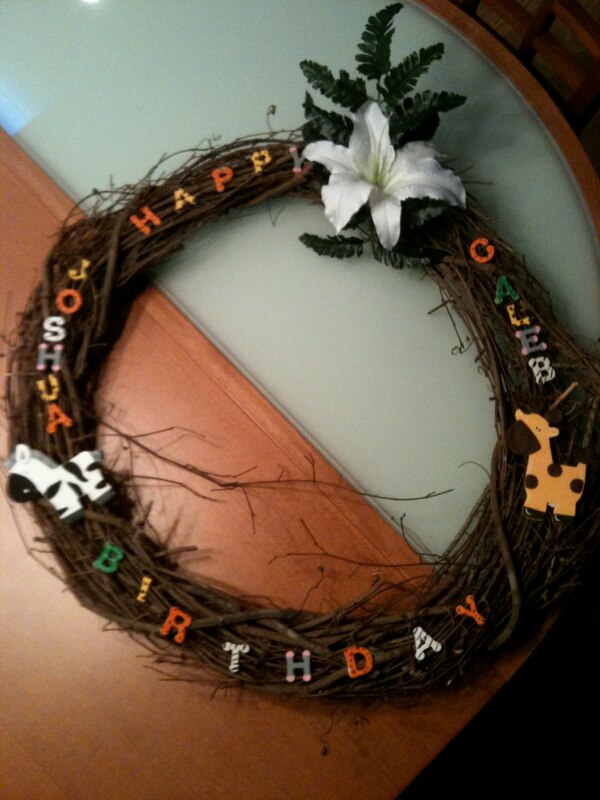 Yesterday Billie and I made this wreath and we are going to take it out to the cemetery later today. I don't know if you can tell, but I hand painted each little letter to look like African animal print. It turned out really cute! It was very fun to make, and it kept me busy yesterday while Matt was at work. It is good to keep me busy, then I am not able to get too sad. I don't want to get sad this birthday, I want to stay positive and count my many blessings. 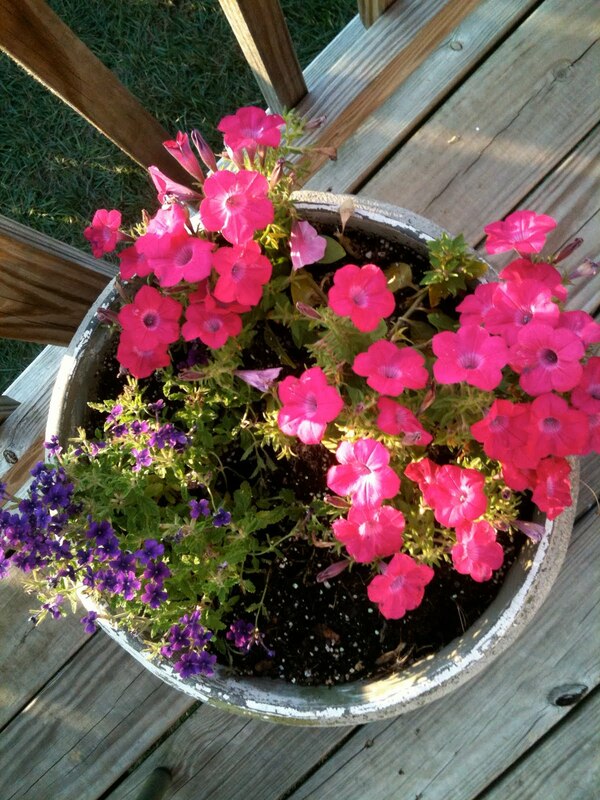 Billie and I also completely transformed our back yard yesterday. I will put before and after pictures up tomorrow or this weekend. We planted shrubs and roses in memory of Joshua and Caleb. This is a surprise to Matt. He hasn't seen it yet, since he got home yesterday after dark and it just wouldn't look good in the dark, we are making him wait until this morning to look at it. We have to be back there a lot now to walk the puppy on a leash, and I really thought we would enjoy it much better if it was pretty back there. We have a little more work to do, somethings that I couldn't do without Matt's help, but once that is done it will be our own little haven to go and sit and relax in. It turned out really good, and I am very proud of it. That said, I have an aching back this morning and blisters and cuts all over my hands! Every rose has it's thorn, and they got me - several times! But it was worth it. I have wanted to do something back there since I moved in four years ago, but I just kept procrastinating. Now we can think of Joshua and Caleb's second birthday while we enjoy the pretty back yard. That also kept me very busy yesterday, and I woke up this morning just feeling excited and happy. I feel so close to the boys today - it's such an awesome feeling! I know I am OK. I am where I should be. I am out of "The Great Sadness." If you haven't read The Shack, you need to. He talks about his "Great Sadness" in the book, and I was able to recall two periods in my life that fall into that category: losing Michael, and losing Joshua and Caleb. It took me 3 years to come out of it after Michael's death, and it has only taken me 2 years with the boys. That is an improvement, at least. Part of it I know is because I have Matt to share my grief with. When Michael died I had lots of support and loved ones that were also grieving his loss, but no one that had been his wife and I didn't have my best friend there to cry on his shoulder. He was gone. He felt so out of reach; I felt absolutely separated from him. When the boys died, I had Matt that was feeling their loss the same way that I was. I could tell him what I was feeling, and he was feeling the same thing. It just helped so much to have someone there that really was going through the exact same thing as me. I am sure going through the loss of my husband also made me stronger and better able to deal with the loss of my sons, too. So I guess I have Michael and Matt both to thank for helping me through the loss of my sons. God has blessed me so much with wonderful men to love me whole-hearted. So today I will count my blessings: Michael, Matt, Billie, Joshua and Caleb. There are many other blessings in my life; like my wonderful family, and both of my in-laws who are my family, as well, and I will take today to thank God for each and everyone. If you are reading this and you are in this list, know that I love you so much and I am so thankful for you in my life. Today we will go to the cemetery and then we are going to Elkmont. I am making us a picnic lunch and we are taking Blue with us, too. It is going to be a great family day, and we are going to celebrate it and be happy. HAPPY BIRTHDAY, JOSHUA AND CALEB! I love you with all my heart. "You recognize that Joshua and Caleb were named for biblical characters by those names. This was not simply a case of names that sounded good but names that represented people who demonstrated extraordinary faith. Their stories are told in the Old Testament. Joshua and Caleb were part of a team of 12 men sent into Canaan before the people of Israel occupied that land. Their job was to recon the land and report to Moses and the people what they found. Ten of the 12 reported back that the people were massive and they lived in fortified cities and Israel would never be able to conquer the Canaanites. But Joshua and Caleb had a different view. They agreed that it wouldn't be easy, but they were confident that God who brought them out of Egypt and safely to the borders of Canaan would also give them strength and wisdom to prevail. However, the people went with the majority report and turned back and, as a result, spent an additional 40 years in the desert. For his faith and trust in God, Joshua was appointed by Moses to succeed him in leading the people, so that when they returned to Canaan, it was Joshua who led them in their conquest of that territory. To this day Joshua is known as one of the more faithful, courageous, and successful leaders of the Hebrew people. Joshua and Caleb are still worthy models for God's people not because they were leaders but because they trusted God totally. In naming their sons Joshua and Caleb, Matt and Crystal set a course for themselves throughout the remainder of their journey to trust God totally. And every time they have said their names, they were reminded of the crucial importance of trusting God throughout, and that is precisely what they have done." Dr. Crocker was right. Every time I speak their names, even today, I am reminded of how we are called to trust God completely. And God was so faithful and good, he didn't let us down. Maybe it didn't play out the way I was praying it would, but God saw us through it and we are stronger people individually and as a couple because of God. As some of you know, we have had more losses in the form of early miscarriages since the boys were born and we have been seeking help from a doctor for this. I will admit there have been days that I have been so bitter and angry that God won't "fix" it for us. But then He always gently reminds me that He has a plan for us, and I just have to trust Him totally. God's timing is perfect as well as His plan. I trust that God has a wonderful plan for our family, and I just have to trust Him totally and watch it unfold. When I think of it that way, I am very excited for what the future holds for me and my wonderful family. I have been thinking of how excited the boys must be to be turning 2 years old tomorrow. Not only were they born two years ago, but they went home to be with Jesus two years ago. I am certain there will be a HUGE party in heaven to mark the blessed day tomorrow. I am also certain everyone is anxious with anticipation and excitement to celebrate. I can see the boys in my mind with little party hats on, balloons all around, and a magnificent birthday cake with two sets of two candles for each to blow out! I am going to try to take tomorrow and celebrate, and not be sad for my loss, but rejoice in the knowledge that my beautiful two boys that brought so many people to their knees before God are spending their second birthday with Jesus. I have said it before and still mean it, as much as I want to hold them and kiss them, I would never take them away from Jesus to do it. That is where they belong, it is where we all belong eventually. And I will rest in the assurance that one day I will be with them again. Let me introduce you to Blue, our new boxer puppy! She is so sweet. She is very smart, somewhat stubborn, very loving, very playful and very fun. We got her Sunday after church. She was in the second litter of puppies we looked at. We went to see another littler on Saturday but decided they were a little too "rough." They had been kept outside, not with the family, and they lacked vital social skills. They were older and we were afraid they were too old to learn what they had already missed. They were adorable, too, so it was a hard decision. But I am so glad now that we waited. Blue is perfect for our family. She LOVES Billie, and Billie loves her. She follows Billie around everywhere, it is so cute. Bob is doing great with her. She even left her "bed" last night to cuddle with the puppy that was sleeping on the rug in the living room. All of that said, it is hard having a puppy. She got up this morning at 4:30. I took her potty and then put her back in her kennel to go to sleep, but she cried and barked until I got her back out at 5:20. Bob got up then, so I figured it was just time for everyone to eat breakfast. She is doing pretty good with potty training. It just takes time and patience. She is only 7 weeks old, so it will not happen overnight. She loves to please us, though, so I don't think it will take long. Matt taught her to fetch yesterday! She is so smart. She doesn't bring it back, but she goes and gets it. She loves to play, as all puppies do, I guess. But she also loves to sleep and cuddle. She is very loving, and she enjoys praise and love more than treats. That may change over time and probably will. She is also learning to go on a leash. Matt has his heart set on teaching her to go into her kennel by saying "go to the Big House." For those of you that do not know Matt is a huge Michigan football fan and their stadium is called "The Big House." It is funny to say, but it doesn't bother me if it makes him happy! I admit I feel a little silly saying it, though. Blue is an excellent addition to our family. I will be sure to update the blog with pictures of her as she grows, and I know I will have plenty of funny stories to share with you about her as she gets more adventurous. She has also been a nice distraction for all of us, helping us not to concentrate on the boys birthday which is on Thursday quite as much. It doesn't completely erase it from our minds, but it allows us to smile and have something positive to put our energies into. I thought I would share with you how wonderful the nurses, anesthesiologist, respiratory therapists and doctors were during our pregnancy, delivery and after. First of all, everyone at the perinatologist were pretty much at our beck and call 24/7. Every question we had, every request we needed, all of it was attended to immediately. Sometimes they couldn't answer our questions. And they were honest about that and always tried to get us the answers we needed. No one there had ever seen conjoined twins before, we were their first, so it was scary not only for us but for them as well. 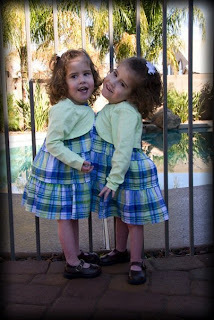 About 6 weeks after we had the boys, they had another set of conjoined twins at the perinatologist. We had them give the couple our contact information, but they never got in touch with us. We were comforted by the fact that we had "broken them in" at the perinatologist and that they were fresh and up to date on conjoined twins. 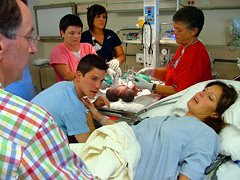 They also could tell those parents with confidence that they had seen and delivered one set of conjoined twins. I am sure that helped the experience both on the staff and the new parents. The people at Children's were so amazing. They had a whole team dedicated to our boys. We sat down in a conference room with them several times and just shot questions out at them. "What if this happens, what do we do?" They were able to "dumb it down" for both of us and explain all of our options so we had a good birth plan in the event of anything. It all went so smoothly because we had no decisions to make once the boys were born, we had already made them and signed on the dotted line and everyone working with our boys new exactly what we wanted and didn't want. I feel like they loved our boys as much as we did, different than us, of course, but I know the boys had an impact on the lives of everyone they came into contact with, and even on those that only heard about them. That is an awesome and inspiring thought. They did everything they could to help give our boys everything they needed to sustain life. There just wasn't anything anyone could do. They were meant to be here only a short time. God's timing is awesome, even if I do not understand it. He gave us exactly what we needed. At the time, I wanted them to live long enough to at least bring them home. But I know now that would have been so much harder. Watching them live, and then seeing them die would have been unbearable. God knew exactly how it would go. He had a plan for us and for Joshua and Caleb. Everyone at Ft. Sanders was equally amazing to us. They were also prepared for us. Roger, our anesthesiologist, was hoping he would be working the day we went into labor. He had heard of us, as most of the staff had, and had been following our blog and praying for us. He prayed with us twice before the surgery. 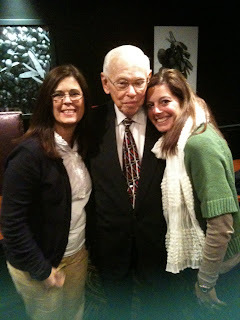 He was sweet and wonderful to us. He came back the next day to check on us and brought us the book "The Shack." We both read it while sailing with Bob and Nancy to Catalina and were inspired, strengthened and changed forever. He also played the Curious George CD during delivery and that soundtrack now always takes us back to that day, in a good way. We used the music for our slide show of the boys, too. Sometimes the songs make me cry still, but most of the time they just make me feel closer to the boys. The funny thing is, we already owned the CD-it just didn't have any meaning and we really didn't think it was that great before. Jack Johnson is now one of my favorite artists. Just hearing his voice makes me think of Joshua and Caleb. The nurses at Ft. Sanders were all great. Some of them came in just because they had signed up to be on our team. They came in just to be there for us, for the boys. It is very humbling that so many people would sacrifice their day off just to help me, someone they didn't even know, through a hard time. They had let everyone know they were going to have conjoined twins, but they were not allowed to talk about it outside of closed doors, not in the elevator, not in the cafeteria, not anywhere. They knew that we wanted our privacy, and they were going to keep our secret. Our friends that had conjoined twins said that it turned into a media spectacle at their hospital, and we didn't want that. If the boys had lived, we would have been forced to share them and at the least let the hospital make an announcement, but since we knew they might die we didn't want to have to deal with media while trying to grieve. Everyone at both hospitals respected that. There is not one person that worked with us that I can't still picture their face. They all hold such a special dear place in my heart and always will. They make me feel closer to Joshua and Caleb. I am so lucky to have them. Thanks for putting up with my reminiscing. It is so good for my soul. Thursday my boys will be 2, it is hard to imagine that on one hand, and on the other it seems like even longer since they have been gone. God is so good to let me be healthy and happy even without Joshua and Caleb in my arms. I was just thinking about the day I went into labor. It actually started the night before, on July 14th, but I didn't know. I just starting crying and I told Matt "something is wrong but I don't know what." We had a doctor appointment the next day, so Matt mentioned this at the appointment to Dr. Bruner so he checked me and sure enough I was dilated to 3 and fully effaced. I remember I said "OH NO!" and Dr. Bruner said "It doesn't mean you are in labor for certain. Are you having contractions?" Of course I had been all day, I had already taken two of my pills to try to stop the labor, I can't remember now what it is called but it is actually a breathing medicine but what it does is relax the smooth muscle so it can make the pain of false contractions go away. I guess I was pretty much in denial. So they hooked me up to a monitor and started timing my contractions and sure enough I was in labor. Dr. Bruner came over to me and said "We are going to deliver today. What did you have for breakfast?" I immediately started crying because I wanted to just keep them in my belly. I knew they were safe there- they didn't have to breathe on their own there. I would have stayed pregnant with them forever just to save them and keep them with us. He let Matt come in then, even though only patients were allowed in the monitoring room. He had a nurse take us over to the hospital and we started getting prepared and making our calls. My contractions really kicked in once we got settled. I was glad we were there at the hospital, and not trying to get there. It was still a long day, they didn't take me back until 4pm. We had lots of friends and family visit us, and we had a lot of people from Children's Hospital come in and go over our plan with us again. Everyone there was ready for us, I felt so safe with them. I was terrified, of course. I didn't have that excitement that I had with Billie that I was actually about to meet my baby for the first time. I was so terrified that they would be still born, or that they wouldn't live long enough for me to get to hold them. I was also terrified that I would either die during the surgery or lose my uterus. OK, I can admit now that was a stupid fear. But I had the weight of the world on my shoulders and I was unable to think very clearly. 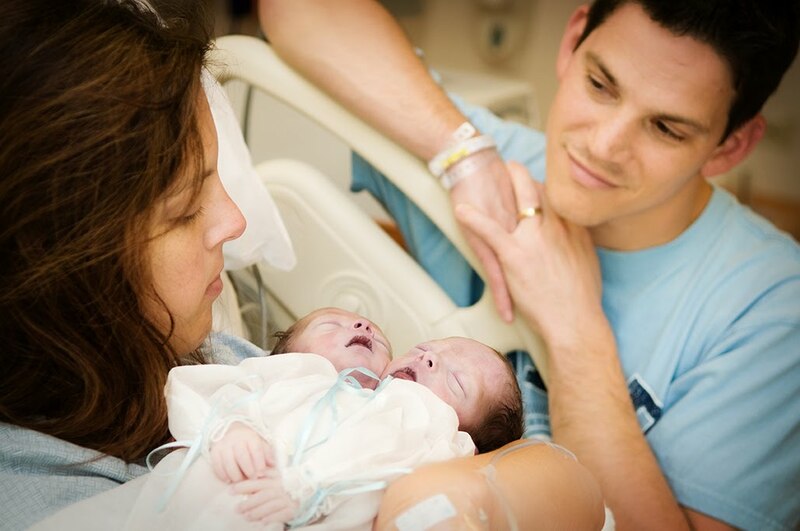 Of course the doctors have to warn you of any complications that might come up, and since our babies were conjoined and were the first set ever delivered at Fort Sanders- they were scared and that made us scared. Dr. Bruner, however, was very calm and seemed very confident everything would be fine. I will save the rest of the story for later in the week. It actually makes me feel better to get these thoughts out like this. I think it is good for me to remember and grieve and I am able to do it and not wallow in my sorrows, but remember the miracles that we were blessed with in Joshua and Caleb. Man, do I love those boys! I think about them in heaven all of the time, and to me they are separated and two years old. My mind just pictures them that way. But their faces are always blurry. I can never get a real clear look at them. I am hoping for another dream of them soon, it has been so long. Until then, I will hold on to my memories. My cousin Kelly was in town from Virginia to visit us this week and took some great photos of Billie and I in Elkmont. We enjoyed Kelly's stay so much and were all sad for her to leave this morning. I wanted to give everyone an update on Billie's ears; the infection is all cleared up, thankfully! She does have some hearing loss still, though, so we are going to have them tested by an audiologist at the ENT. Hopefully they can get to the root of the problem and we can get her back up to hearing 100% quickly. Molly (our nurse practitioner that is treating Billie) said that she could see some scarring on the ear drum. She also said there could still be some fluid back behind the ear drum that she just can't see but that the audiologist would be able to find and tubes would be an easy fix to the problem. I am hoping by our Monday appointment that she has regained a lot of her hearing if not all of it and we get a clean bill of health. I do ask you all to pray for her, though. I feel just awful about the whole thing still. I should have taken her in earlier, and I will not make that mistake again, hopefully! Bless Billie's heart - and EARS! She loves music so much, it would be absolutely horrible if her hearing is permanently damaged. But Molly does not think this hearing loss is permanent, so we are just praying that it is temporary and short lived! I can't finish the blog without mentioning July is a huge month for us. July is sad and a very hard month for me to get through. We lost Michael six years ago on July 21, and of course the boys were born and passed on July 15, 2008. I can not believe it has been two years since I held my beautiful babies, and I can't believe Michael has been gone six years. We also lost my grandma on July 29, 8 years ago. Needless to say, I could take the whole month of July and stay in bed and hibernate through it, but I choose to push on instead. Some days I am so bitter, and I am angry. But other days I am just thankful that God saw me through my losses and try to hold on to my faith that He has a wonderful plan in store for me and my family- so much better than I can even imagine. I am pretty ready for that plan to be shown, but I know I have to wait for God's timing not my own. I know there is a reason for everything that happens, and that God will use it all to glorify His name, but I am not a very patient person. It is hard to remain faithful but when I am struggling I continue to remind myself that when I am weakest He is strongest and God's Grace is sufficient for me. Some days I have to repeat that to myself over and over again, but it eventually gets through my stubborn bitterness and it always makes me feel better and gives me renewed Hope in God's plan for our lives. I promise to update the blog as soon as I know something about Billie's ears, and I am also going to try to put some pictures of the boys up next week as well as blog about some memories from our pregnancy and their birth. Love to everyone! Hello, everyone! Just a quick update. 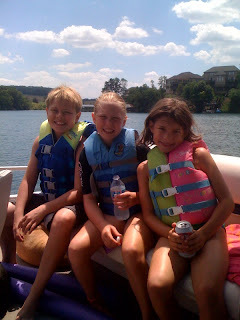 Billie stayed last week with her Grandma and Grandpa Rosecrance at the boat house for "cousins week." She had a great time. She complained a couple times of her ear hurting but she kept saying it wasn't bad, and then she would be fine; sleep fine, play fine, eat fine and no fever. When she got home last night she said again her ear hurt and I looked in them and found some blood and debris, so this morning first thing we went to her doctor. Bless her heart. She had double ear infections, ruptured ear drums and swimmer's ear on top of it all! I feel so guilty. I should have taken her way before today. She must have an insanely high tolerance for pain. She told me later that it hurt really bad, but she just didn't want to miss anything at the lake. Of course Cathie and Brian would have taken her to a clinic, but she kept saying she was OK and that it felt better. We know to not listen to that next time. I knew Sunday I should have taken her, but I let her talk me out of it because she just didn't want to go. Next time I will go with my gut. Poor baby. She has a fever today and feels terrible. So we are giving her lots of rest and love. She is on an antibiotic plus she has a an ear drop that is an antibiotic and steroid to take care of the swimmers ear. She can't swim for three days, which shouldn't be a problem since she has been at the lake for four days! Everyone enjoy the heat, at least here in Knoxville it is so HOT! Happy Summer in just a few days! Happy Saturday, everyone! I have just been relaxing this morning with coffee and Billie. I love Saturday mornings when we have nothing we have to do. Although, I really need to be cleaning my house! That will happen a little later this morning. I am done with school now for the summer, that is the best feeling ever! I have nothing except my family to worry about every evening and weekend. I am studying to take the GRE, I have that scheduled for August 3, so I do have some studying still, but it is different and doesn't seem as "pressing" as when I am preparing for an exam at school. Probably because I am a procrastinator and I have almost two months to prepare! But since it really tests you on a lifetime of knowledge, I probably can't "study" that much, it is more about practicing my test taking skills and familiarizing myself with the format. Billie has soccer camp next week at UT, and she is excited about that. I woke up missing my boys so much this morning. Yesterday I read a blog of one of my good friends that also had beautiful conjoined twins that passed away shortly after birth. It was a flash back of the day they found out their girls were conjoined. I read it on my lunch break, and I sat out in the gazebo at work and just let myself think and cry. Sometimes I think that is so good for me. I tend to push my memories and thoughts into the back of my head to "deal with later" and then never pull them back out. I sat there after reading it and let my mind wonder the to day we found out our boys were conjoined. I tried to remember how it felt. I remember going in so happy and excited, and leaving 8 hours later exhausted and filled with panic. How can something so wonderful turn so bad? We were so hopeful, though. I just knew they would have two hearts and be separable. We then had the task of telling our family and friends. We left my car there, since we had driven both cars that day, with plans for Matt to bring someone back later to get it. Matt called his best friend, Danny, and asked him to drop everything and come over and I called Kellee and asked the same. They both did it without asking any questions and were here within minutes. It was so hard to say out loud at first. There is nothing in the whole world that could have prepared us or our loved ones for the news that we were having conjoined twins. We are so blessed to have such wonderful and supportive friends and family surrounding us. They carried us through that time. God put the people we needed in our lives way before we would have the boys, just to support us through that time. God is so good! Like my friend Vanessa said yesterday, our lives are now split into two time periods; before we found out about the boys, and after. I guess that is true with any "big" thing that happens in your life. I still say things like, "That was before Michael got sick." or "before Billie was born." And even "before I met Matt." If you have read "The Shack," you know that he judges time by "The great sadness" and while I read that book I kept thinking that I have two periods in my life like that: the day I found out Michael was sick, and the day I found out my boys were conjoined. Those two days changed my life forever. But I still do not have any regrets. I still love the person God has created in me, and I know that all I have been through is part of God's plan. God is good. He is always good. Even when I do not understand or like it, I will hold on to my faith in God's plan for my life and that he knows what he is doing. Hopefully this works. Enjoy! Thanks to Matt for filming and editing and making it a web-friendly video for me! We had a very busy weekend. Billie had a soccer tournament on Saturday, they tied 1 - 1. Courtney (my cousin Kellee's oldest) graduated from high school on Saturday, too. Billie had a piano recital on Sunday, which these pictures are from. And Courtney's graduation party was Sunday, too. Billie did great! She played "Lean on Me." We took a video of it, and if I ever figure out how to post it, I will. We had a very good time at Kellee's house after the piano recital. We got there very late, but were still able to visit with some of our friends and family. 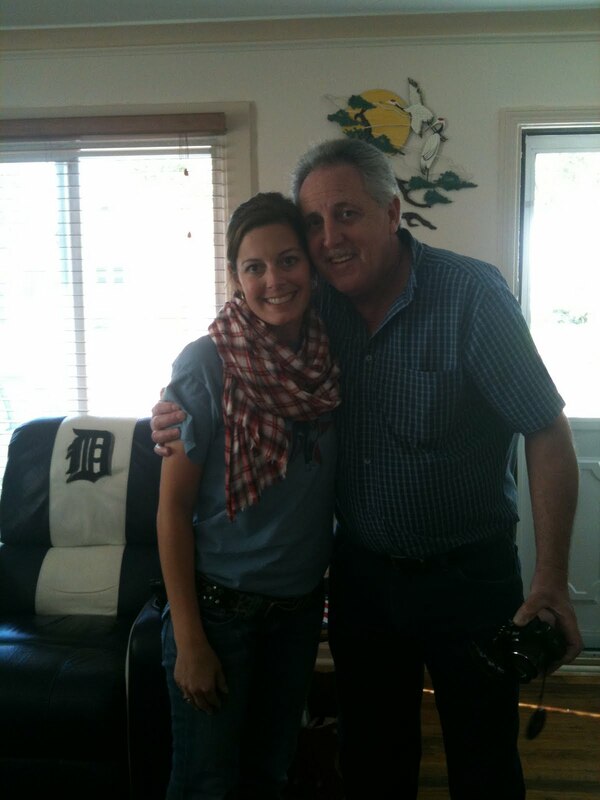 I am so proud of the young woman Courtney has become. 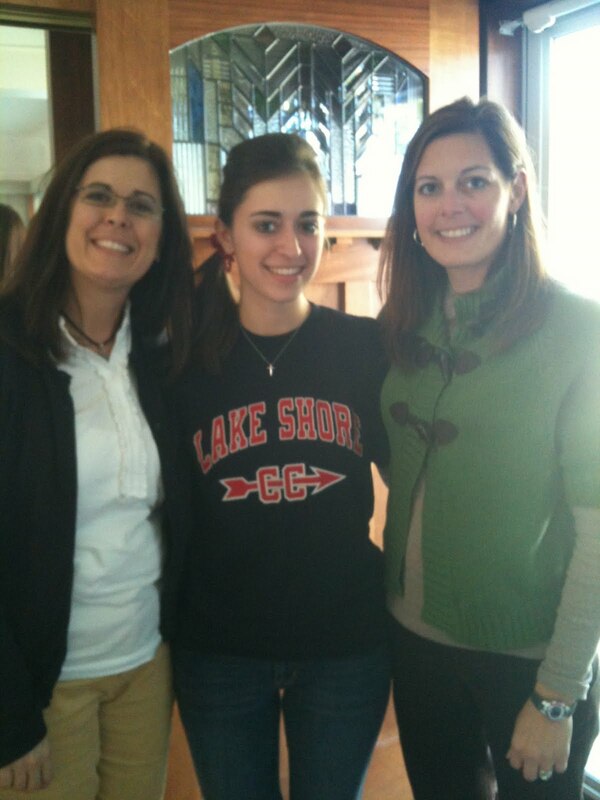 She is so sweet and so smart; she got two scholarships! 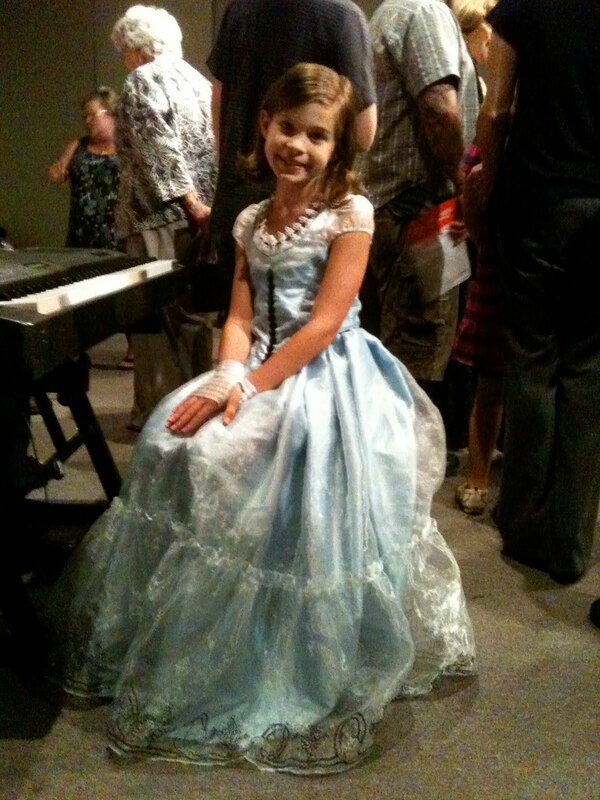 I love that Billie has her and Mackenzie for role models. They are both just wonderful girls. They are very sweet to Billie, and she absolutely adores them. I am so glad since she doesn't have siblings around, that she has Courtney and Mackenzie to help fill that gap. She will always have them to confide in, and I trust them to give her good, sound advice. I have to get to school, but will try to update again soon! Good morning! Sorry I have let over half of May get by me without a blog. Let me bring you all up to date. I had finals the first week of May. They were exhausting - 5 in one week! But they all went great and I am officially a senior now! That is so amazing and exciting to me. I am really going to make it--I see a light at the end of the tunnel! I am taking sociology now for a miniterm class. I love it. My teacher looks JUST like Clint Eastwood. We asked him yesterday if he has been told that before and he said "No, but my kids call me Clint." He is so funny. Retired from the Army, with a PhD in Sociology. We have an exam today, I think when he hands me my exam I will say "Go ahead, make my day." So miniterm is only 3 weeks, so I get 3 credits in 3 weeks! I love it! Billie is finishing up 3rd grade. Today is 3rd grade day. She was very excited going to school today. I am going to join her after my exam. 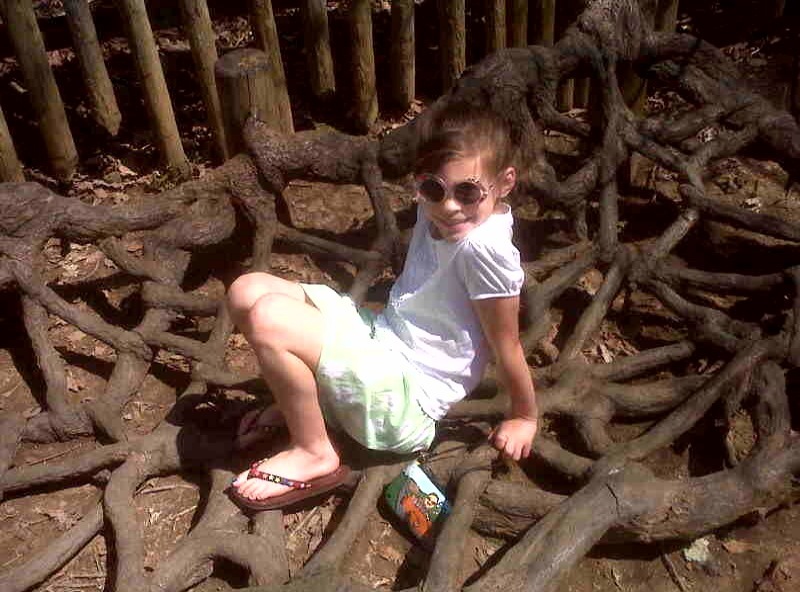 I can't believe she will be in the 4th grade next year. She was reminiscing yesterday about the last year and she was saying how she loves Mrs. Kauffman so much. She will miss her next year. We have been so lucky with all great teachers every year, I sure hope 4th grade is the same. Friday is her last day, and she has a half day. Her friend is going to come home with her to her Grandma and Grandpa's house (I have to work)where they will be having a end of the school year pool party! I sure hope all this stormy weather passes before then. I guess we are getting our April showers in May! I am pretty tired of it, myself. Matt is doing good, too. He has been working on his golf game. I am so glad. His new office overlooks the golf course, so he will go to the driving range on his lunch break or after work for a bit. He has played several games on the weekends with his friends, too. I am glad he can get out and fun on his own. I know it is good for his soul, and his golf has improved so I guess it is good for his game, too! We are looking forward to June when we take our family vacation to Elkmont to go camping with all the Rosecrance/Spriggs family. It is going to be so fun. We are going to have about 30 people and we have a group camp site so we can all be together. The fireflies will be out, so we will have nightly shows, too. Billie is especially excited. She loves to camp. She loves the out doors, loves to get in the mud and get dirty, explore the woods and creeks. I think that catches everyone up to date for now. I will try to post some recent pictures later in the week! Love to all! I know a lot of you already know, but I thought I would fill in those non-family members that read our blog about my cousin Kristin. For those who do not know her, she is my cousin and we are about the same age and since we were babies we were inseparable. In the picture from my last blog, she is the little blond girl. My Grandpa called us "The Two Kris's (or Crys's if you want to spell it my way!) We often times would meet at my grandparents house and spend a few days together with them. When I moved to Tennessee I thought I would probably die because I wouldn't be able to see her anymore. We wrote almost daily and tried to always one-up the other one by sending goofy cards or gifts, sometimes really cool posters and things. My dreams came true about a year after I moved, her and her family moved here! It was amazing, for the first time in our lives we got to go to school together. Over the years we have remained close, until just recently, but I won't go into that. On Monday night, April 12, Kristin was in a very bad car accident. She was flown by life star to UT hospital with multiple injuries. She remained in ICU for the better part of the week, and had surgery on Friday on her spinal cord and her leg. She initially had bleeding in her brain and her spleen, but they were able to get control of that eventually. She received several blood transfusions. She also has a "nick" in her liver, but the doctors said that will heal itself. She also has a broken pelvis, in several places, a broken shoulder, broken ribs and a gash on her head that needed staples. She has a place on her lower leg that looks like a shark bit her, and she will eventually have a skin graft on that. She is in a room now, and is talking a little more and doing better. It was very scary for a while, though. And she has a very long road to recovery. She will eventually be moved to a rehab center. She was thrown from the truck, and it is a miracle that she is alive. I find myself thanking God every day the he spared her life. I know she has a lot of work ahead of her to get better and back to being whole again, but I know she can dig down deep and find the strength to do it, and I am also praying daily for that. Please remember her and her mom, especially, my Aunt Margaret Ann in your prayers. She is always by her side, and is wearing herself out to be there. I guess I knew how dangerous cars were, but I am reminded of it now. Everyone drive safely, and don't let your cell phone or anything else be a distraction. It only takes a second for a terrible thing like this to happen. AMAZING! And kind of scary for me because I can see that I am the spitting image of my mom, who is shown here when she would have been about 10 years younger than I am currently! I think this was probably in 1977, but I could be a year or two off either way. That would make me, the little one in the front in the sailor dress about 5 and my sister, Nikki, about 8 and my mom 27, give or take. Kristin in the front, the only blonde in the bunch, would have been 4, Kellee on the far left 7 (or almost) and Kim I guess 9 or 10. I think I remember this Easter Sunday, but most of them we spent with Kim, Kellee and Kristin so I could be just remembering them all! 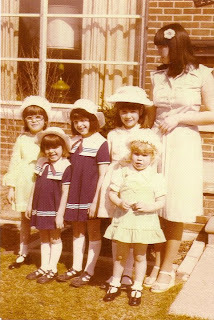 I do for sure remember loving to wear an Easter Hat! That was my favorite thing about Easter. Wonder why we don't do that much anymore? I stole this picture off my sister's Facebook page, thank you, Nikki. I thought everyone would get a kick out of it. I can definitely see Billie in me as a little girl, too. How fun. Good times, I was a very lucky little girl to grow up with all of my cousins around me. The five of us were always so close and always had the best times together. I hope you all had a great Easter weekend. 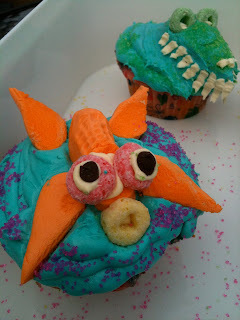 I will try to post more Easter pics later in the week when I can. Happy Easter Eve, all! 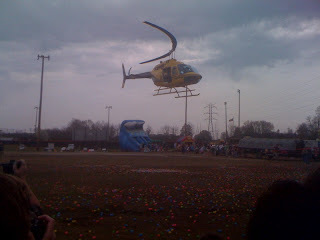 We took Billie this morning to the "The Egg Drop" at Powell High School. This first picture is from that. They dropped eggs out of a helicopter! It was so much fun. Billie got to jump in "bounce house" things and slides and we saw lots of friends there. There was a huge turn out, tons of people. ONE LIFE Church hosted it and they did a great job. Billie didn't win any special prizes, but she got to get lots of candy and see some friends so she was happy. Billie and I went to the zoo yesterday, and the other pictures are from there. 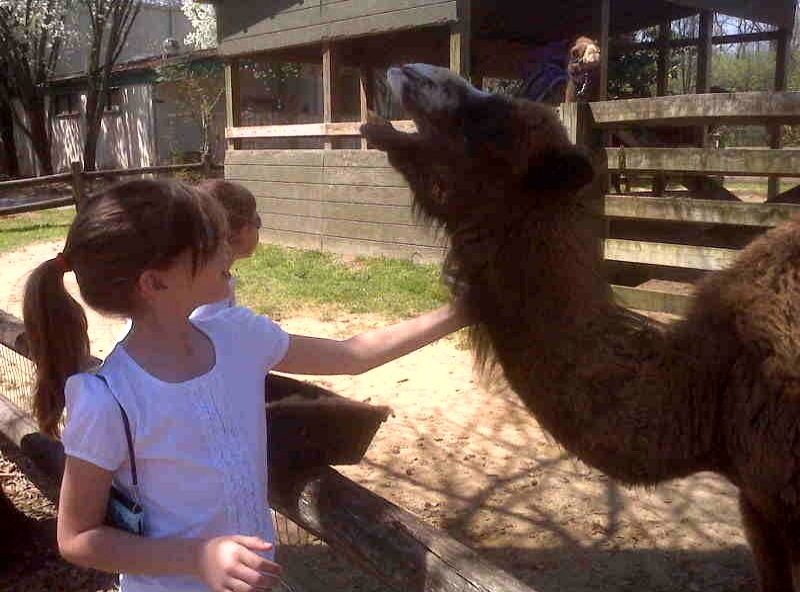 They had baby camels that just loved Billie. I am sure they were really hoping she would give them some snacks, but she thought they just loved her so that is all that matters. We spent a good while watching "George" the one year old Chimp. SO CUTE! Oh my goodness, I totally see why people have them as pets because they are so much like little human babies, but they grow up to be strong, scary Chimps. Billie had a wonderful time at the zoo, and so did I. Matt worked half a day and then golfed with a friend in the afternoon. He had a great time. His office has actually moved, they moved Monday to their new location and he over looks the golf course all day, making him want to be out there golfing instead of working! So he plans to take advantage of the close proximity and get a lot more golf in from now on. I am so happy he has the opportunity! I am trying to study while Matt and Billie wash the cars. I am sure I got the better end of that deal! I hope everyone is enjoying the beautiful weather and you all have a wonderful Easter. I am in awe of the sacrifice made for my sins on the cross this weekend so long ago. I am so thankful Jesus washed away my sins so that I may have eternal life. Love to you all! 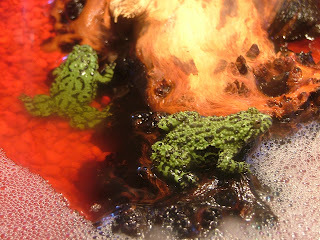 Let me introduce you to Jack and Jessie, Billie's Fire belly toads she got for Christmas. She was so excited to have them. That was really all she wanted, or at least what she wanted the most. She comes in from school and the first thing she does is go to the aquarium and she always says "Hi, babies. Jack, Jessie? How are you? Did you have a good day? I love you! I missed you so much!" and in that ooey-gooey voice we use to talk to babies and puppies. It is the cutest thing in the world. I am going to let you in on a secret, but PLEASE don't tell Billie. It will crush her. Jack and Jessie bonded with each other right away. Billie caught them "snuggling" on more than one occasion. We were pretty surprised we hadn't had any tadpoles, actually. So Jack and Jessie were in love and Billie was in love with both of them, and it was a beautiful and wonderful thing. Then one night Matt was feeding them and he walked away just for a second to get a rag to wipe down the glass, leaving the lid open. I was standing right there, and I let Bob in and then closed the lid, never looking down. You know what is coming, right? The next morning at 5 am when Bob got up to eat, I found something in the floor right in front of the front door. I didn't have my glasses on, so I really didn't know what it was. I got some tissue, thinking to myself "Bob didn't even make it out the door!" and got down real real close to the dark blob on the floor. I got within inches of it before I realized what it was---JESSIE! I immediately picked her up and took her to the sink. Somehow I thought I could revive her with water. Thinking back now it is so funny, but at the time I was crying and shaking! I could just only think of how devastated my little Billie was going to be, I had to try to save her. But I quickly realized it was just too late for Jessie. I wrapped her in paper towels and laid her gently in the trash can. I could see later in the afternoon having a funeral for a frog. I tried to turn to studying, but could not keep focused so after about an hour I woke Matt up. He immediately knew something was wrong. He was as shocked and felt just as bad as I did. 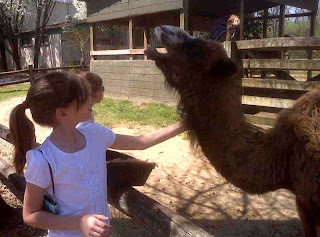 We decided not to tell Billie before school but to wait until that evening. After he went to work and talked to his friends there, we both decided we would just try to find a good Jessie 2 and sneak her into the aquarium. We both felt responsible; he shouldn't have left it open, and I should have checked the ground knowing it had been left open. We just didn't see why we should put her through the heartache, especially since she has lost so much in her short life. She really loves these frogs, and it would really be terrible on her. Matt went to the pet store after work and got the closest thing to Jessie he could find. Later that night when it was time to feed them, Billie got very upset and ran to get Matt. She said "Matt, I don't know if I just can't tell them apart anymore or what is going on but something is wrong. Jack is hiding in Jessie's spot and Jessie is out here in Jack's spot, and Jack won't eat! He is going to die if he doesn't eat!" She started crying. Jack would not eat for about 3 more days. It was terrifying for Matt and I. Here we were trying to spare her pain, and now for Jack to be in shock and not eating, it was awful. We really think Jack was in shock, after talking to the pet store. We think he was love sick for his Jessie. Looking back to the night she had jumped out, he was acting weird then and wouldn't eat. We couldn't find Jessie, but just thought she was hiding under the log. We figured Jack would eat later, and just didn't think that much about it. Poor thing, he was probably wondering what we had done with Jessie! He has since gotten better, although he is not his normal self and probably never will be. He and the new Jessie have finally decided to get along with each other, but you can tell they are not in love the way Jack and the first Jessie were. I know this all seems so silly, but if you could have witnessed it you would understand. We told Billie we thought he was in shock because we had moved the aquarium to her room from the living room. She bought that. I know I have just admitted to lying to my child. And I almost always think that honesty is the best policy, but I am OK with this decision. I still think we spared her the pain of the loss, and there just was no harm done. I hope when she is older and finds out the truth, she will understand and not hold it against us. I do feel guilty for not being honest with her, but I am still glad to have spared her this pain - she has just gone through so much and it isn't fair. This was my way of making up for some of that unfairness.